If you’re a family caregiver of someone with Alzheimer’s disease, you know firsthand the challenges of going into the community with your loved one. This 30-minute training provided by Home Instead Senior Care® is designed to help a business’ employees understand the disease and provide simple techniques to ensure customers with Alzheimer’s are treated with compassion and respect. Misconceptions about Alzheimer’s disease persist. But, thanks to broader education efforts, more people understand what it means to have Alzheimer’s disease or another dementia illness. Be sure to tell the businesses you frequent about the Home Instead Senior Care network’s Alzheimer’s Friendly Business℠ program. Attention Business Owners: Program Trainer Materials including the quiz are available as downloads. Business owners can conduct training onsite using these resources. 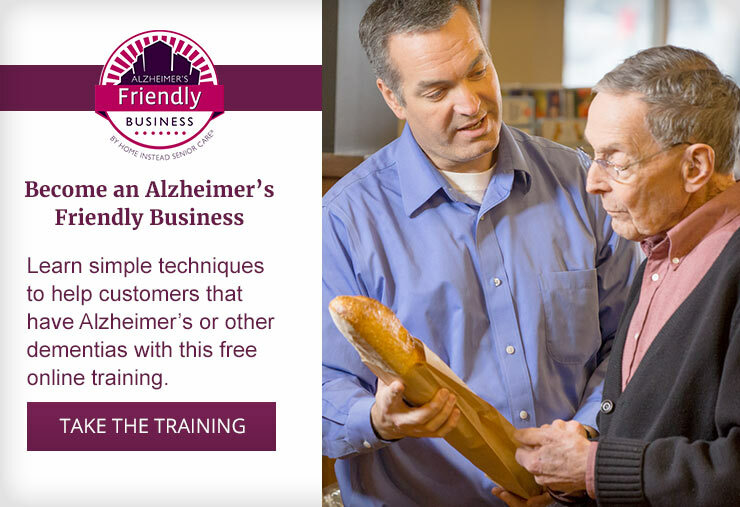 However, if you would like to receive a free Alzheimer’s Friendly Business window cling and break room poster, complete the online “Take the Training” module. A window cling and poster will be sent to your business upon successful completion of the quiz at the end of this module.